Benjamin is a little softie who was born to hug. A gund exclusive. 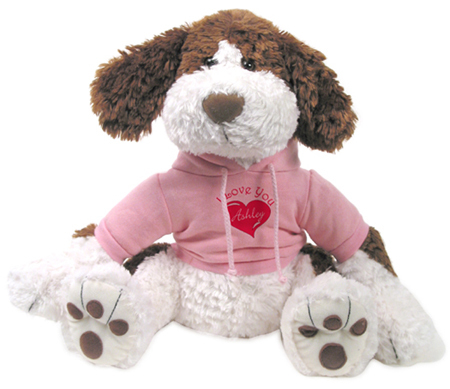 This little big footed puppy is sure to warm your heart and bring lots of smiles and laughter to all your dog lovers. Benjamin's silky fur and floppy ears are just too hard to resist! He comes with with your choice of available graphics customized by you and printed on your choice of a white or pink tee shirt or choose a sweatshirt for just $3.50 more! Benjamin sits at 9.5 inches.